I plan pretty awesome weddings. I helped my brother and sister-in-law during their planning process and realized that my attention to detail and organization skills allowed me to coordinate their wedding without any hiccups (at least none that they know about). I've since become the designated wedding planner for my friends and family. I also make a mean Christmas cookie. The ideal workstation I've created in my head is either a loft space or in a large attic. It has tons of natural light and it's decorated colourfully. One wall is full of frames that hold photos, art pieces and prints displaying my favourite affirmations. Another wall has floor-to-ceiling bookshelves to house my personal library. I'm quite literally obsessed with the Harry Potter series by J.K. Rowling. 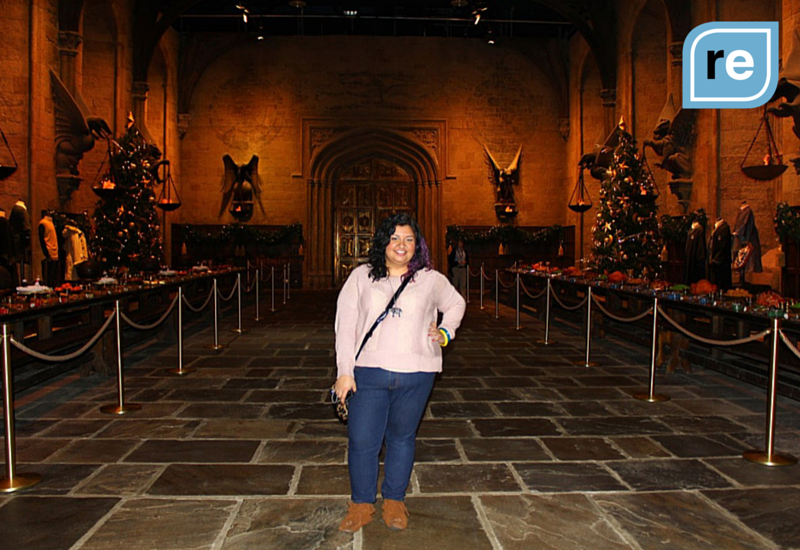 (In the photo above, I'm standing in the actual Hogwarts Great Hall!) She created this vivid world of magic and whimsy, where unicorns exist and magic wands are the only accessory you need. But when you look past the magic, you find that the books are about courage and friendship, about facing your fears and striving through adversity. Plus, the detail she's put into the series is astounding. I'd love to get a peek inside the brain that came up with Quidditch. There isn't one single thing I can think of that makes me think, "that was my biggest success." For me, my greatest achievement is the fact that I am striving for a life that is extraordinary. And sometimes, my life is pretty extraordinary. But when it's not, when I hit roadblocks, I still continue to strive for that life. That, to me, is something to be proud of. I'm a rebel because I've never considered myself "normal." As a kid, that meant that I hated doing what was expected of me. Now, being a rebel means I own the fact that I'm a bit weird. I look at the world through a different lens than most of the people I've met, which gives me a unique perspective.